Air fryers come in all shapes and sizes. We recently took a look at larger models for families of 4 which you can see right here. Today, though, we’ll be looking purely at smaller capacity models perfect for students, singles or even smaller families. All you need to do is shoot for an air fryer of 2.7 quarts or below and you’ll get that perfect sweet spot: a fryer small enough to fit in a cramped kitchen while still giving you enough food for your needs. So, why should you buy an air fryer in the first place? Put simply, conventional deep-frying is an extremely unhealthy method of cooking. The food might taste great, but with so much oil, it’s best reserved as an occasional treat. If, however, you can’t resist that taste sensation, by investing in one of these mini convection ovens, you can enjoy that lip-smacking crispiness without the ruinous effect on your waistline and your overall health. This 2-liter BLACK+DECKER manages to combine generous capacity and slimmed-down dimensions for the best of both worlds. Suitable for singles and smaller families, the Purify is powerful, user-friendly and capable of delivering lip-smacking food without the health risks of deep-frying attached. If you thought all air fryers were prohibitively expensive, think again. This pocket-friendly beauty from Dash has a 1.6-quart capacity good enough for 1 or 2 people and it’s compact enough for the smallest student kitchen or the pokiest apartment. Get top-notch fried food the healthy way! 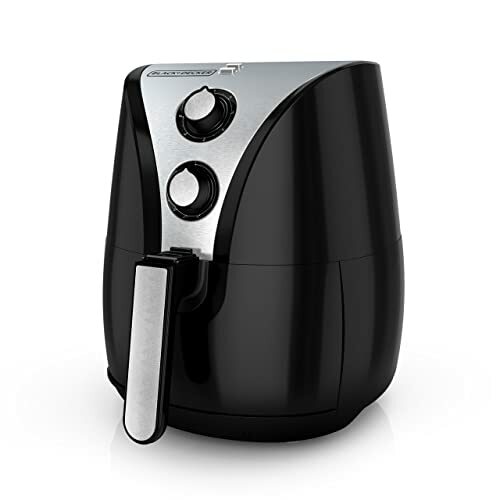 Our overall winner for the best air fryer for students, singles or small families is the BLACK+DECKER Purify HF110BSD. Weighing just 12 pounds and occupying little space on the countertop, you’ll be able to fit a surprising amount of food in this dinky unit. The basket gives you enough room to feed 2 to 4. Whether you want to rustle up some snacks or a full meal, you can do so without the oil you’d need for conventional deep-frying. The thing is, you won’t need to sacrifice that trademark fried taste to eat more healthily either. The 60-minute countdown timer comes with automatic shut-off for your peace of mind. Temperature is easy to fine-tune and you can ratchet the heat right up to a maximum of 400 degree Fahrenheit giving you outstanding versatility. 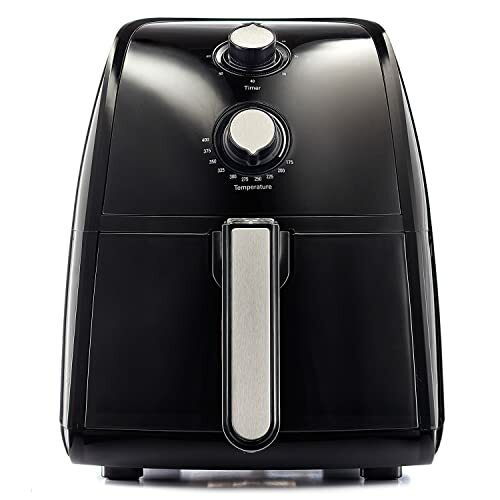 For a durable and highly capable small air fryer from a brand you can rely on, this BLACK+DECKER will not disappoint. 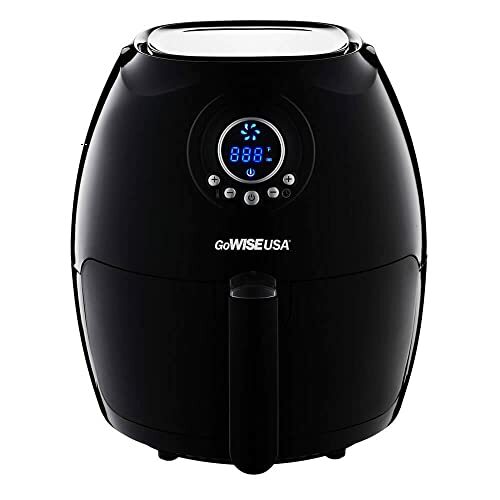 Although the Dash looks flimsy, this lightweight air fryer is deceptively rugged. The 1.2-liter capacity is ideal if you’re cooking for yourself or you want light snacks for 2. 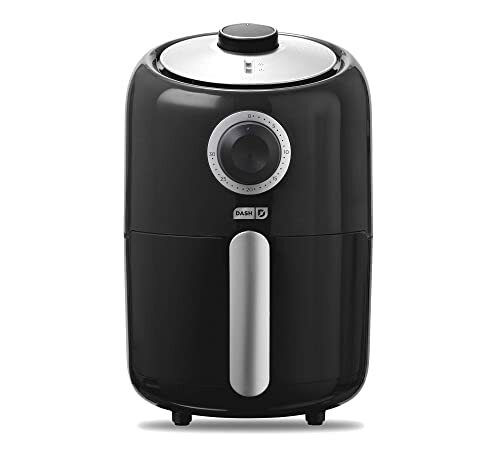 Whether you’re a student living in a small apartment or a single looking to eat healthier food with less oil, this air fryer hits home. The fryer basket capacity is 1.6 quarts and its non-stick surface means you won’t be fighting against stuck-on mess when you’re done. You can fit in 12 chicken wings or 1 pound of fries so, while it’s a small capacity model, you won’t be sold short when it comes time to eat. If black or white doesn’t fit with your kitchen décor, opt for the brighter red or blue models for a burst of color in the kitchen. If you’re looking for an air fryer on a budget, Dash proves you don’t need to spend a fortune to eat better food. Another BLACK+DECKER up next with this diminutive 2-liter packing some serious tech onboard. The proprietary cooking element is combined with a pair of brisk fans so you’ll get the functionality of a mini convection oven without all the room needed to accommodate it. Looking lean and mean in monochrome, this appliance is small enough to slot onto a cramped and crowded counter without stiffing you in terms of capacity. Whether you fancy burger or fries, chicken wings or onion rings, get traditional fried food without the impact on your waistline or cholesterol levels. In terms of capacity, you can expect up to 8 cups of food so you won’t be feeding a large family but it’s more than enough for anywhere up to 3 people. Easy to clean, simple to use and built to stay the distance, enjoy the treat of fried food without the accompanying guilt. Remarkably cheap but looking like an upscale model, the GoWISE USA steps things up in terms of capacity without being too bulky and dominating your kitchen. The intuitive digital interface is straightforward to use even if you’re not the biggest tech fan. Expect quick results with a nice temperature band giving you complete flexibility with your recipe choice and food served in as little as a half-hour. And the best thing? You won’t need to ladle oil everywhere to enjoy that crisp and brown finish. Maybe you’re wondering where to get started with air frying. If so, you’ll appreciate the useful guide with fully 50 mouth-watering recipes so there’s no excuse not to press it straight into action. 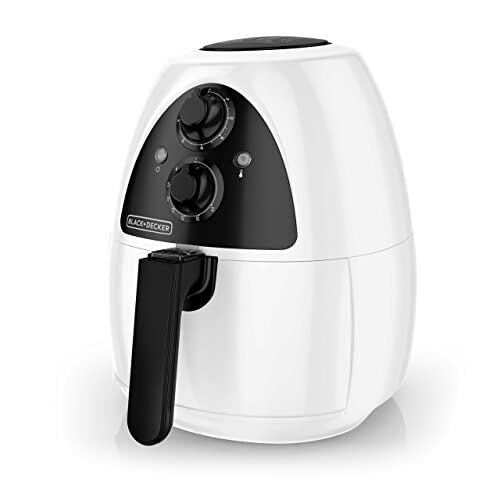 For a hard-hitting small air fryer good for 1 to 3 people at a highly competitive price-point, this neat model is well worth popping on your shortlist. Last but certainly not least, the BELLA delivers oil-free frying at its finest. The 1500-watt heating system operates like a convection oven with hot air efficiently circulated to fry your food without needing ladles of oil. You can cut right back on the amount of calories you’re consuming without sacrificing your favorite dishes or the taste you’re accustomed to with fried food. Temperature range is the standard 175 to 400 degrees Fahrenheit so you’ll be able to knock up all your preferred dishes with ease. A simple dial is all that’s required to adjust this with another dial above to tweak the timing. You can fit 2.2 pounds of food inside the basket so, while still considered a small air fryer, you’ll easily feed 3 in a single sitting. When you’re done cooking, removable parts are all safe to slip in the dishwasher so you can relax and enjoy your dessert without being niggle by a tasky clean-up job at the sink. For a solid and long-lasting air fryer that’s also extremely versatile, we can’t recommend the BELLA strongly enough so what are you waiting for? By now you should have a sound idea about which of these air fryers would be the best addition to your cooking arsenal. All of them come in under the 2.7-quart sizing recommended for smaller air fryers and you might be surprised at how much food you can shoehorn into these compact appliances. Don’t forget to come back soon since we’re constantly testing a huge range of products so you can simplify your buying decision whatever you’re buying for your home. We’re here to save you time and money while bringing you the very best in household products. Come back soon for our look at handheld vacuums. We’re almost done with testing and we’ll have our report with you over the weekend. Now enjoy that fried food guilt-free!